Centennial established an EL Education school network partnership in 2013 with a commitment to implementing the comprehensive EL Education model, including character education, challenging academics, and learning expeditions. The school also adopted EL Education’s Language Arts Curriculum, first in grades 3-5, and then in grades K–2 (in 2016). With the guidance of EL Education coaches, leaders at Centennial worked to create a culture in which students would love learning and find meaning and purpose in the work they do in school. To build consistency in instruction that would support students, they changed the daily schedule so that grade level teams shared an 80-minute block of collaborative planning time and provided professional development on strategies for student-engaged assessment. ELA teachers also attended a three-day summer institute, which introduced them to the curriculum modules and, during the school year, attended institutes on strengthening writing with models and critique, and research skills. “Improving the classroom culture throughout the school and building students’ growth mindset really created a foundation for success,” according to Becky Martinez, the school’s EL Education coach. Once teachers saw how much students wanted to learn and what they were capable of, they got even more excited about showcasing student work. Then they began to enhance the curriculum modules so that student work would bene t a real audience. For example, third-grade teachers teaching a module called “Overcoming Learning Challenges Near and Far” invited a professional artist to teach students how to design bookmarks that were both beautiful and functional. Students then added a service component to the product. They sold their bookmarks at a local coffee house, raising funds for books that will be sent to a Denver shelter for homeless women and children. Centennial has begun a digital portfolio of high-quality student work based on the modules, which can be viewed online. A walk-through assessment of how many students were asking questions, working on task, and contributing to the classroom dialogue conducted in the fall of 2015 and spring of 2016 showed that the percentage of students demonstrating these engagement behaviors increased by more than 20% across all classes. Centennial students are also becoming better readers and writers. In 2014-2015, just 15.9% of students in grades 4 and 5 were meeting or exceeding proficiency expectations (Levels 4 and 5) on the Partnership for Assessment of Readiness for College and Careers (PARCC) assessment. In 2015-16, reading proficiency rose to more than 33% in grades 4 and 5—a 17.4 percentage point gain. Denver Public Schools scores rose just 3.9 percent, and Colorado scores remained roughly the same in comparison. Based on these results, leaders expanded their implementation of the EL Education Language Arts curriculum to include all grades (K-5) in 2016-17. Percentage point gain in students meeting or exceeding proficiency expectations on the PARCC assessment from 2014-2015 to 2015-2016 (grades 4 and 5). 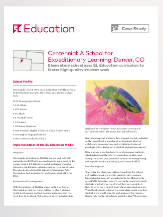 Download the PDF of the Centennial School for Expeditionary Learning case study here.